It's been a non-stop sort of week and, rather than write it all down, the best my brain could do was put the little Monopoly sweepstakes stickers from the grocery store on the playing board. Let's see if I can recap as much as possible! Monday: snow day. I made scones, which came out rather well. Tuesday: (Day 9) We had our class on meringues. Mostly we made French meringues, which are prepared by whipping the egg whites and then adding sugar, no heat involved (unlike Italian and Swiss meringues). We then added nut flours and more sugar of varying proportions and made many large disks of meringue to be used in cakes. In particular, a dacquoise is a cake that uses meringue layers instead of sponge cake. We made one cake and froze the rest of the meringues (6 different recipes' worth) for future cakes. I consider this a gift to our future selves. 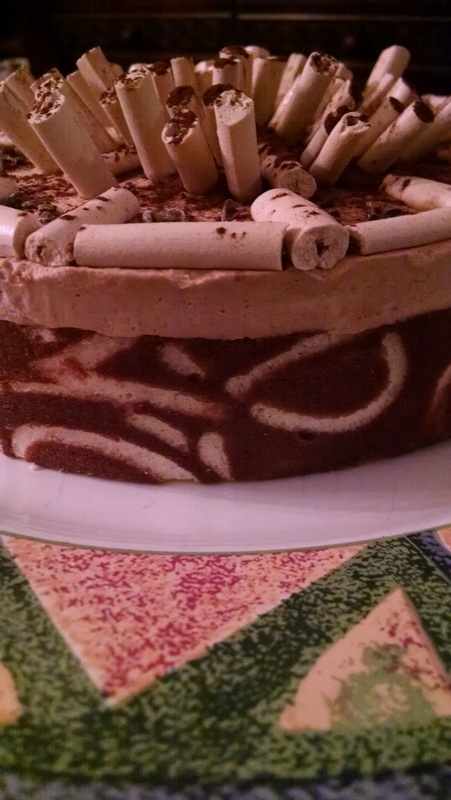 The cake we did make was a [Coffee and] Cognac Mousseline Dacquoise. 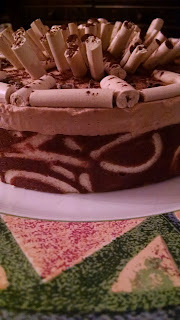 We even made a special kind of Italian meringue with coffee extract to make the little decorations. Observation: I'm getting a little better at piping. Later that night we finished our ServeSafe course and took the exam. The test should be graded in a week or so. 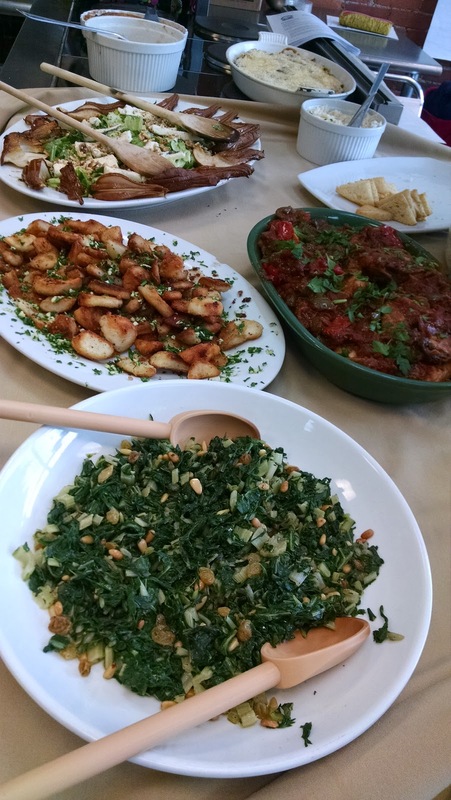 Wednesday: I assisted the Regional French Cooking class again. This time it was the southwest area: Basque, Bordeaux, Limousin, and so forth. Cassoulet, chicken piperade (pepper/tomato/onion, very similar to a cacciatore), mushroom crepe gratin, salt cod turned into a brandade with potato (this one surprised me; I did not expect to like it and LOVED it instead! 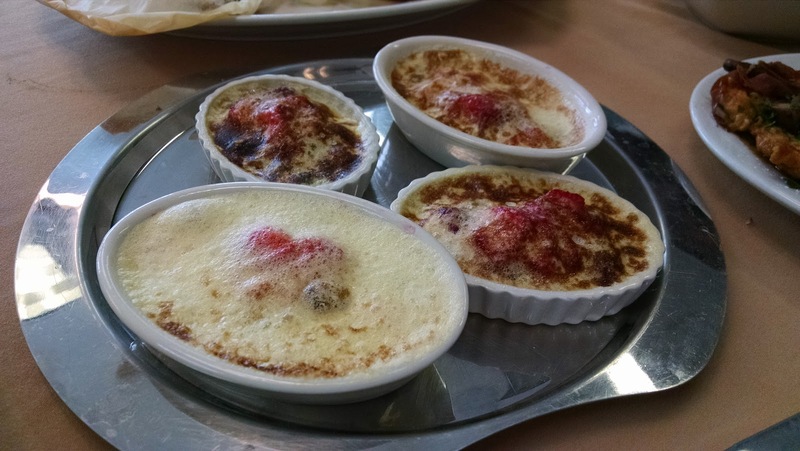 ), clafoutis and a soufflé. 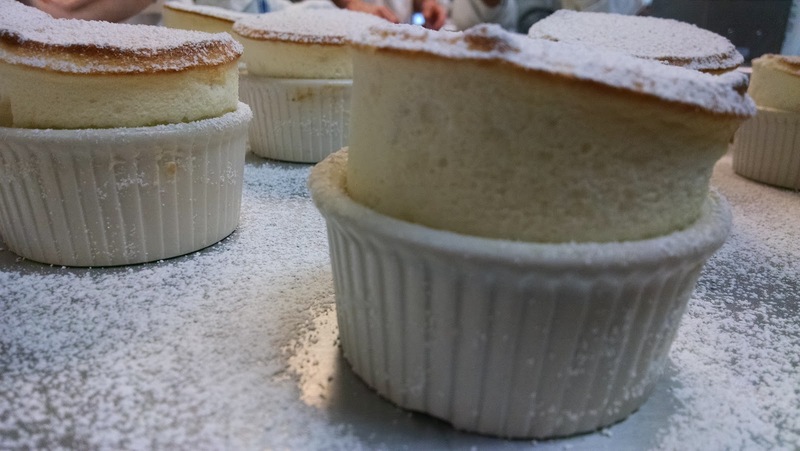 I feel personally responsible for the Grand Marnier soufflé not rising as chef told me I could advise the student without her help and I had never made a soufflé before. So, clearly, I did not give her good advice. Anyhow, I am perpetually amazed at how much gets done in a few hours. Thursday: (Day 10) We had a make-up class since we'd had the snow day on Monday. This was dessert sauces and...soufflés. We made an excellent lime soufflé which was served with a honey lime sauce. When the soufflés came out of the oven we each took a spoon, carved a hole in the middle, and filled with the sauce. Wow. And the soufflés rose perfectly. I feel redeemed. We also made tons of crepes (dessert, chocolate, and pumpkin) and chef made a batch of ice cream from creme anglaise (which makes an excellent ice cream base). Our team made jasmine tea sauce, passion fruit coulis, and a Suzette sauce but instead of orange juice and Grand Marnier we used lime juice and tequila. 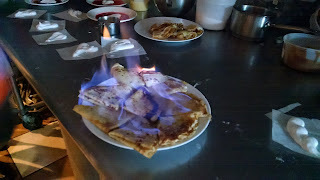 The crepes, flambéed with tequila, were excellent. I got to make a Sabayon (egg yolks, simple syrup, and champagne, whipped into a foamy sauce over a double boiler) which I then spooned over fresh berries (too many! says Chef) and bruléed under the broiler. There were other sauces, and some molten chocolate cakes that I never saw getting made let alone baked (probably because I was working on the Sabayon). Sadly they were overcooked so I opted to skip those calories. I might try them at home another time. Clean up took FOREVER. There was another class in that kitchen at 6 pm. We finished cleaning at 5:55 pm! I managed to get the train and then the bus home just in time to load the 10 year old in the car and go pick the 14 year old up at the Y. Dinner wasn't until about 8 pm. Friday: Work. Yes, I'm still doing that! Fortunately, it was a good day and I was out at a reasonable time. I could go to the grocery store and grab some lunch for myself at my friend's restaurant before I had to get home. Oh, and we have another quiz on Monday. And I'm only one game piece away from winning a Big Joe Grill. Impressive. And I'm two game pieces away from winning a million dollars.